The first quarter of 2019 has already passed. How are your New Year’s resolutions coming along? As you know from past experience, you can get so caught up in the everyday bustle of life that you forget all about what you set out to accomplish in 2019. If one of your resolutions is to set out for more adventure, look no further than jet ski rental Myrtle Beach at Action Water Sportz. Whether you have always wondered about jet skis or you have never even thought about taking a ride on one, for great adventure it’s a great time for you and your family. Racing across the water on a jet ski is a memorable experience, and it will undoubtedly be one of the highlights of your summer. If you need any more convincing, the following are some of the numerous reasons that a jet ski rental Myrtle Beach is an excellent addition to your bucket list. One of the main reasons that people lease jet skis is due to the fact that it gives them an incredible excitement without the risk. You don’t need to go skydiving or cruise around the globe to take part in a thrilling experience. Renting a jet ski can be the most enjoyable adventure you ever have, and as long as you wear a lifejacket and follow the proper guidelines in riding a jet ski, it is exceptionally safe. You can even ride with a friend if you do not want to do it alone for the very first time. 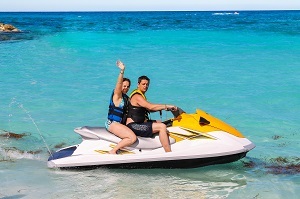 At Action Water Sportz we provide a guide with every group of jet ski participants so you and your family save whether they are on the waterway or an ocean ride. Jet skis are also a great way to leave the monotony that often sets in towards the end of summer. Whether you are preparing a late getaway or you live in Myrtle Beach, you might be looking for something new to do rather than the usual routine. Hop on a jet ski and within seconds you will not be tired any longer. Finally, the last reason why we believe you need to try riding on a jet ski is it is something fun and new to experience. You might be cautious at first, but trust us when we say you will be returning for another ride as quickly as your very first ride is over. Whether you want to go alone or with a buddy or member of the family, riding jet skis will be the highlight of your summer or other time of the year. As your resource for boat rentals in North Myrtle Beach, we are here to help you keep your New Year’s resolutions in check. This is one resolution that is fun to keep and we want you to know that we’re here to help! Getting outdoors and being active has never been more enjoyable than with Action Water Sportz Jet Ski and Pontoon Boat Rental. Whether you want to get physical and try your hand at skiing, or you simply just want to start getting outdoors again, we’ve got the solution to your resolution! Contact the staff at Action Water Sportz Jet Ski and Pontoon Boat Rental today to make your reservations.